For more than two hundred years, U.S. coins have spotlighted our national heroes, paid tribute to our greatest achievements, and commemorated significant events. 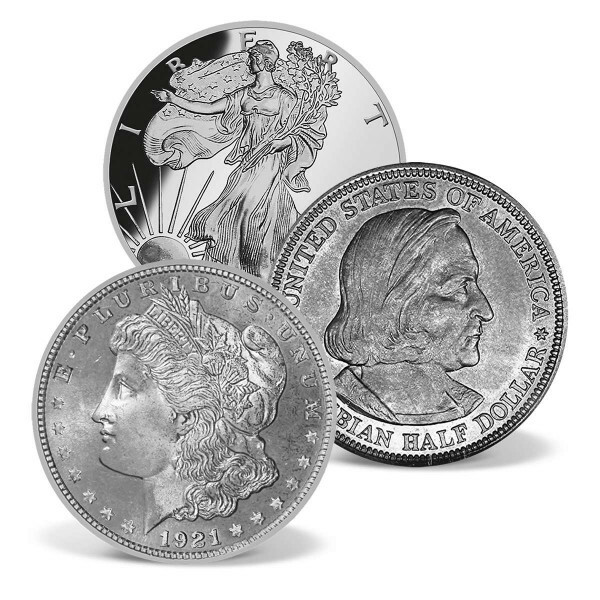 The Walking Liberty half dollar is considered the best designed silver coin in American coinage. The Columbian Exposition half dollar was the first commemorative coin in the history of the U.S. Mint. The 1921 Morgan Dollar was the lastyear the George T. Morgan design was issued. The satisfaction of actually owning a piece of history makes collecting rare U.S. coins truly special. Every coin has traveled a different path throughhistory. As a result, each one is a unique embodiment of the hopes and dreams of our founding fathers. These coins will never be reproduced. Therefore, when they disappear into private collections, it will become difficult - perhaps impossible - to acquire them at any price. WALKING LIBERTY HALF DOLLAR: Minted from 1916-1947 - 90% Silver The Walking Liberty half dollar obverse is consideredthe best designed silver coin in American coinage. As a result is was used as the obverse design of the modern American Silver Eagle bullion coin. MORGAN DOLLAR: 1921 - 90% Silver The 1921 MorganDollar was the last year issued of George T. Morgan's design. This series, which started in 1878, was replaced by the Peace Dollar in 1922. COLUMBIAN EXPOSITION COMMEMORATIVE HALF DOLLAR: Mintedfrom 1892-1893 - 90% Silver Minted as a celebration of the 400th Anniversary of Columbus' famous journey. This coin has the distinction of being the very first commemorative coin in the history of the U.S. Mint.